Utagawa Kunisada/Toyokuni III (1786-1865) Enjoyments of Beauties of the Present Day (Nijushi ko toji no hanamono): Fond of Travel (Tabi ko), 1863. Oban. This and its companion print on this page is from Kunisada’s last series of prints devoted to women in 1863. It is a beautiful and notable series as was all of his late production. The title is self explanatory - twenty-four separate images of women engaged in different contemporary pursuits. Though only a matter of months until the momentous Meiji restoration and years after the first stirrings of modernisation in Japan, this is backward looking. Kunisada shows traditional Japanese women, dressed in kimono and with elaborate hair pins engaged in traditional pursuits. There is a beauty and a tenderness in these images and also perhaps a yearning for a disappearing world. 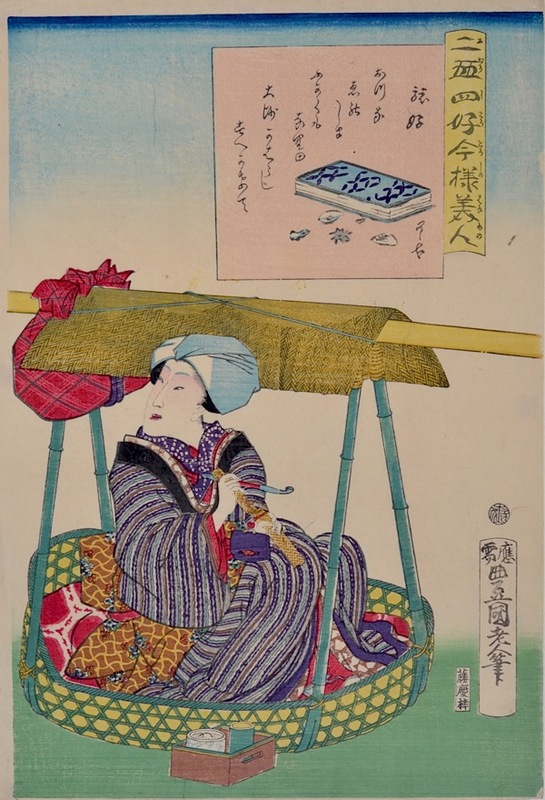 This print shows a handsome woman sitting in a palanquin (norimono). She is resting on a journey, a neat box of provisions next to her, and smoking a pipe. The cartouche is enigmatic; some seashells and a bound book suggest that she is travelling to the sea, perhaps taking one of the many guide books that had become so popular as, during the mid-century, travel restrictions were lifted on the population as a whole and women were allowed greater freedom. Her blackened teeth suggest that she is married, as does her status - note how her clothes appear ‘drab’ compared to the richness of geishas and courtesans and how her head is covered and not adorned with hairpins.The inset drawing is by one of Kunisada’s pupils, by the loose, painterly style of the drawing I suspect the artist is Ryoko, a little known ukiyo-e artist who studied under Kunisada and remained active in the 1860’s and 1870’s. A very beautiful print delicately drawn and typical of the quality of much of Kunisada’s late work. The print is in exceptional condition, full size and with margins. Colour and impression are very fine. Signed oju Toyokuni rojin hitsu. Published by Fujiokaya Keijiro (shorindo) with Toshidama seal.